Unlike our previous notebook reviews, I didn’t plan on jumping into this one and conducting much benchmarking. The reason is simple: we’re finding that most benchmarks hold little value overall. Things might change if we had access to a slew of current-gen notebooks at the given price-point we’re focusing on, but that’s just not realistic. But we don’t consider that inability to be a downside, because a major focus of consumers today is the “experience”, not raw performance numbers that are hard to relate to. Just a quick note, though. If we are to take a look at a high-performance notebook, you can expect there to be some benchmarks. On a notebook like this, with such modest specs, there seems to be little point. That said, I liked the X202E from the moment I hauled it out of the box. I actually received two notebooks at the same time from ASUS (the other is the 15.6-inch S56C), and it’s the X202E that’s proven to grab me the most. Size aside, both notebooks look similar, so what is it about the X202E that attracts me? Oddly enough, the touchscreen. I’ve never been too sold on touchscreens for PCs, and even still, I couldn’t imagine having to use only a touchscreen for Windows (sorry, Microsoft), but as a complement, it’s fantastic. If not for Windows 8, I’m not sure I’d feel this way, because where I’ve used the touchscreen the most has been inside the Start screen. Even when I have had a mouse hooked up, I found it much easier to navigate left and right with the touchscreen. With no mouse hooked up, I found myself using it even more because I generally don’t care for touchpads too much. Though some buttons on the screen could be small, I was most often fine using touch versus the touchpad for them. If you had asked me a year ago if I could have imagined I’d have these thoughts today, I would have probably been pretty blunt in saying no. I don’t expect everyone to enjoy the touchscreen in those ways like I do, though, and I even feel a little bit odd preferring to touch a button than deal with a touchpad. But it is what it is. There’s of course a lot more to the X202E than a touchscreen though, so let’s move on. In terms of comfort during use, I found the notebook to be a winner there as well. The keyboard is about as perfect as I’d expect one on a notebook to be (a mechanical KB on a notebook might be a little off-putting), and as mentioned before, the touchpad is also great. The “Smart Gesture” software we talked about on the previous page shows all of the things that can be done with touchpad gestures, and because some are pretty subtle, it’s worth checking out. For example, I’m sure I’m not the only one who sometimes finds it difficult to right-click something with a touchpad. ASUS eases the pain by allowing you to bring up the right-click menu by tapping with two fingers. As you’d expect, you can also zoom in and out where the opportunity exists, and rotate as well. You can also scroll up and down a page using two fingers, but I found that to only be ideal if you’re planning to read something rather slowly. You cannot go from the top to the bottom of a page quickly with this method, so for that, I instead used the touchscreen, which wasn’t just quicker, but felt more natural as well (in this instance, it becomes like a tablet). For its price-point of $500, I think the X202E is an impressive notebook in terms of design, aesthetic and features, but the one sticking-point is with the display and performance. The display, while able to deliver a spot-on touch experience, lacks the crispness and color-richness of an IPS panel. When using the notebook away from any other computer, the downsides are less obvious, but I was pretty shocked when I was looking at the same thing on both the notebook and my aging Dell 2408WFP in terms of color accuracy. Perhaps even crazier, my ASUS Transformer TF201, a tablet of about 14 months old, has a better display than the X202E does. The performance issue should be obvious. 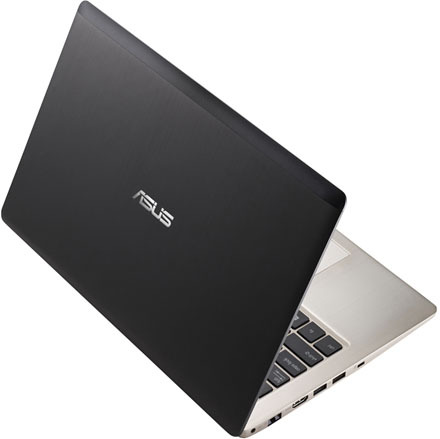 We’re dealing with a notebook equipped with a modest Intel Core i3 dual-core chip that tops-out at 1.8GHz. This, along with the fact that we’re dealing with a single-channel memory configuration, means that the notebook will be good for overall use, but nothing too heavy. Juggling Photoshop among other applications wasn’t what I’d consider smooth, but it isn’t too atypical of what I’d expect at this price-range. And please don’t make me talk about gaming. It’s better to pretend that gaming doesn’t exist with this notebook, because even at low settings, Counter-Strike: Global Offensive was unacceptable. I had much better luck with some aged games, such as Asheron’s Call 2 and The Sims 3. It’s obvious that ASUS’ goal here wasn’t to deliver high performance or a high-quality display, bur rather a great design, eye-catching aesthetics and an admirable feature-set. That’s an important trade-off to note. The X202E is like a Smart car that looks like a Porsche that has the versatility of an SUV. And that’s what the X202E boils down to. If performance or an IPS display isn’t a major concern, the X202E offers a lot. It’s attractive, sports a great keyboard and touchpad, has a touchscreen that works very well, boasts the best audio system we’ve ever heard in a notebook at this price-point and it offers decent battery-life ratings. The lack of an IPS panel is undeniably a downside, but we couldn’t find an equivalent system to this that had one (those that did were 15-inch models). I spent a good hour perusing Amazon’s top 100 list, and of all the laptops at this price-point and form-factor, I’d quicker pick it up than the others. If you understand the goals and caveats of the X202E, it makes for an excellent choice at its given price-point. Superb audio system for this form-factor and price-point. Handles 1080p high-bitrate (<20Mbit/s) content like a breeze. Good price ($500 USD at select e-tailers, including Microsoft). Performance is lackluster. Single-channel memory implementation is baffling. Not for beefier games – at all. No IPS display, and it shows. McAfee’s trialware is so naggy, you’ll be quick to uninstall it.